Founded in 1884, Uwajima-Unyu Ferries enable you to travel between Shikoku and Kyushu by sea, avoiding the alternative option of a long drive. The crossings between Yawatahama and Beppu take around 2 hours and 50 minutes, while the crossings between Yawatahama and Usuki are about 2 hours 25 minutes. Beppu is a famous tourist destination for its hot springs. 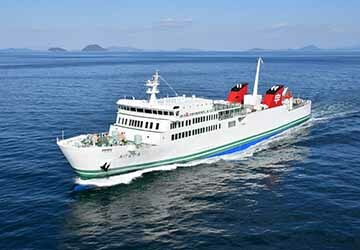 Uwajima-Unyu Ferries use 4 ultra-modern ferries to operate its routes – Akatsukimaru, Oita, Ehime and Sakura carrying from 485 to 610 passengers and more than 145 cars. Akatsukimaru is their newest ship having been in service since 2014. On board you’ll find and spacious passenger areas, massage chairs, iPad rental service, wifi internet and a shop provides a variety of products including souvenirs and alcohol. Whether you are travelling for business, taking a holiday or a short break, Uwajima-Unyu Ferries are the ideal solution to visit Shikoku and Kyushu, anytime. Direct Ferries provides a ferry timetable and price comparison, based on your search criteria, allowing you to compare Uwajima-Unyu Ferries products with multiple ferry company timetables and fares in one search. Compare Uwajima-Unyu Ferries timetables and prices now with all alternative ferry operators before booking your ferry ticket to ensure you get the best option for your ferry trip.